One Indian Girl is written by the most famous English Indian writer of India Chetan Bhagat. It is published by Rupa Publications. He has written this book from a girl's perspective and give us an inside into the Indian society's psyche. 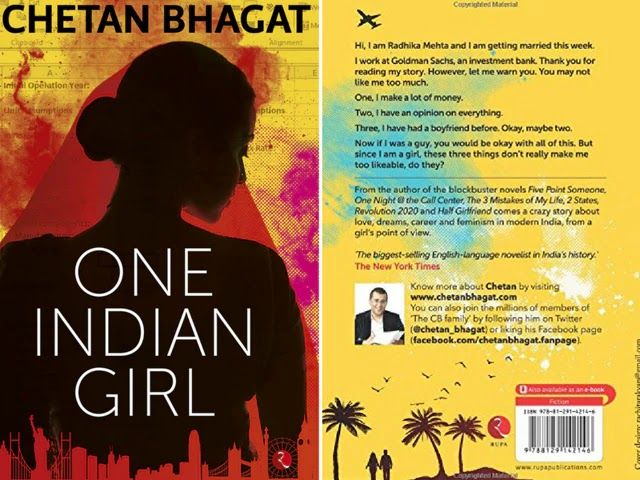 Cover: Girl in wedding attire on the cover gives the hint of the setting of the book i.e Radhika's (protagonist) wedding. The city landscape at the cover edge and beach setting with couples holding hands gives us the glimpse of her life moments as told in this book. It is a simple nice cover. Plot: Radhika is present with her family in Goa for her destination wedding waiting for groom's family to come. Brijesh Gulati is the groom whom she has met through a matrimonial site. During her wedding preparations she received call from Debu her ex-boyfriend from New York days who wanted to come to Goa to rectify his mistakes and marry her. Neel whom she dated in Hong Kong also called her with the similar intentions. Both of them arrived at her wedding and request to leave the marriage and marry her. She remembers her life in last four years in flashbacks and what happened to these relations. Meanwhile she is also bonding with Brijesh. She was confused about her decision. Her life is puzzled between these three men in her life. What has happened to her relations? Whom she marry? What she finally decides? All these questions are answered in this book filled with Indian masalas. Hits: The theme to tell a tale through a girl's perspective by a male writer is interesting and I must say he has done a good job as far as presentation is concerned. He writes in easy and familiar language which always make his books easy to read. The characters are like-able many of whom you can recognize from your surroundings. It's an easy to appeal to the audience book. Misses: Predictability makes this book uninteresting to me. From the start it was easy to guess what coming up next and the climax is also dull. Since his book is turning into movies his writing is becoming film friendly or easy to adept in a film. I noticed influence of many Hindi movies like Humpty Sharma Ki Dulhaniya, Wedding Pulao, etc. His characters also looked like coming out from Imtiaz Ali movies. Interesting but not exciting. Verdict: It's a one time read you can use to pass your time. Rating: I would give it 2/5. I am a huge fan of CB but this time, I found it drab, dull and repetitive. The climax is amateurishly done. There are interesting moments, in parts. But, disappointed with this one. I don't read his books. After 5 point someone, they are repetitive. But I am a huge fan. He gave the guts to many writers to work on their passion. Book Review - Is It Maya?